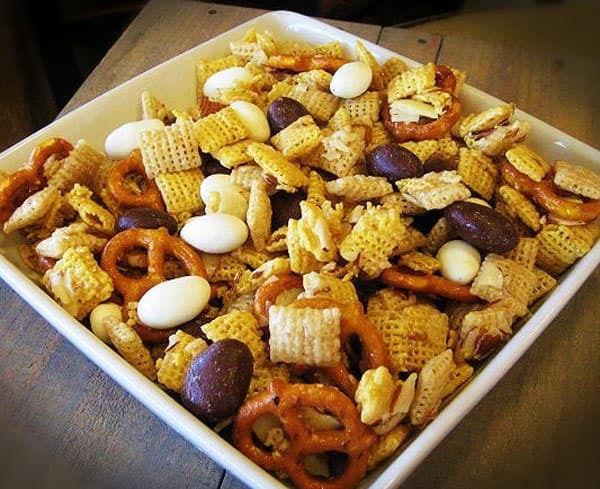 Place cereal, S&J sliced almonds and S&J Buttery Twists in a large bowl; set aside. In a heavy saucepan, combine sugar, corn syrup, and butter. Bring to a boil over medium heat, stirring occasionally, until a candy thermometer reads 250 to 266 degrees (hard ball stage). Remove from heat; stir in extract. Pour over cereal mixture, mix well. Let cool (about 5 minutes); add S&J Chocolate Covered and Yogurt Covered Almonds to the mixture; mix. Spread mixture onto waxed paper-lined baking sheets; cool. Toss to break apart. Store in an airtight container.